We work with Friar Tux to provide us concert attire for the boys. Checks are made directly to them. Tuxedo fitting will be on Friday, October 20th, during class. Click here for the 2017 Tuxedo Order Form. Questions re tuxedo? Contact Dana Mahony. 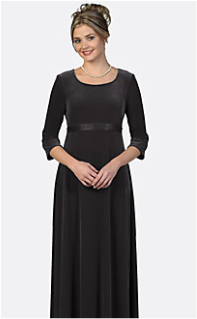 Empire style gown featuring a "large scoop" neckline and 3/4 sleeves; with satin sash ties.